Jennifer Fielder and Trey Smith of the band Smithfield are no strangers to the concept of fate; it was a well-timed Thanksgiving dinner and a chance meeting with a William Morris agent on a trip to Nashville that solidified the duo’s plans to take on the professional music scene together. Though fate played a large part in bringing the childhood friends together for the sake of Smithfield, Fielder and Smith are also not strangers to hard work and taking risks to see a dream come to light. With an ironclad work ethic and unparalleled talent, Smithfield is beginning to see the well-deserved fruits of their last seven years of labor in Music City. Both born in Texas and family friends from childhood, the harmonies audiences now know as Smithfield didn’t begin until both Fielder and Smith had grown up. “Trey and I were both in college in the Dallas area and Trey’s rock band had just broken up. I was at my family’s Thanksgiving table when his cousin told me that his band was done and she thought we’d sound great together. I was trying to be nice,” Fielder laughed as she remarked, “So I told her to let Trey know he could reach out to me any time to sing together. Not long after that, he came over to see what we could do and we discovered we had these really great harmonies and our voices blended perfectly together. I was a month away from Nashville to play a show during CMA Fest and I invited Trey and his family to come out with me so we could see if we really wanted to give this a go.” What started as a trip to Nashville to test the waters wound up being the deciding factor for Smith and Fielder to start their joint venture as a duo. “It was on that trip,” Fielder explained of their beginnings, “where we really decided we wanted to form Smithfield. We were fortunate enough to meet a booking agent through William Morris and he gave us thirty minutes to come to his office and play him some songs. We were so nervous; it was our first big meeting in Nashville and we played cover songs because we hadn’t started writing together yet. During the meeting, he gave us an honest rundown of what it was like to live in Nashville. He thought we had some raw talent, but if we were going to move here [Nashville] then we needed to start writing, figure out who we were as artists, figure out our own sound. Trey and I spent the rest of the week walking up and down Broadway, playing bars and the CMA show, and that was when we knew. We sat down to breakfast and agreed we were only going to get one shot at this and it had been our dreams, separately, since we were kids. The fact that we’d known each other for so long and had never sung together then came together so seamlessly and had this week in Nashville felt like fate to us.” Without looking back, Fielder and Smith took the plunge and moved to Nashville in 2011 to pursue their dreaming of making music full time. The history of Smithfield seeing initial success in Nashville is something that must be explained, and then quickly gotten out of the way. While their experiences with their first label have been important in shaping an ironclad work ethic and business knowledge for the duo, their history in town is small fish compared to their heroic efforts to succeed, their unparalleled talent, and their bright, fun personalities. With a lot of hard work upon moving to Nashville, it didn’t take Smithfield long to land a deal with Bigger Picture Music group. Before Smithfield had a chance to embark on their radio tour to promote a brand new album in 2014, Bigger Picture folded- keeping Smithfield’s music for themselves in the process. For many, this would break spirits and be an ultimate defeat. For Smithfield, it was an inspiration to learn their own business from the inside out and find a new way to make the music they felt so passionately about making. “What happened with Bigger Picture made us stronger both as people and as artists. After we lost our deal, Trey and I looked at each other and decided, ok- we’re going to get to know our business better than anyone else we work with from here on out. When we were with Bigger Picture we didn’t know anything, so there were some positives on the business side that came out of this all going upside down. After they folded they wanted $30,000 for the record we had completed with them. Here we were four years into town, we had great music we’d written, and we weren’t able to release it or to even get it back. Instead of fighting we did a Kickstarter campaign and told our story. We didn’t know what expectations to have with the campaign, but we exceeded our goal,” Fielder explained happily, “Our entire record that’s out now is fan-funded. Through this process, we met Pete Fisher, back when he was at the Opry, and he became a great mentor of ours. He listened to us and to our story and helped us write a business plan. He’s helped us to get our first music video, professional photos, a publicist- all those things you’d do with a label- on our own. Trey and I have learned everything about how to run our business from the ground up and everything is organic now. We’ve gotten to hand select our own team and everything has come full circle.” Fielder and Smith’s outlook on their trials and their successes in Nashville will no doubt play a large part in their future triumphs. With humility, kindness, and keen business sense, the duo are well armed to take Nashville by storm, leaving everyone in their wake with a smile on their faces. Their attitudes are certainly a factor in their success, but it is their talent that is unmatched in today’s Nashville country scene. 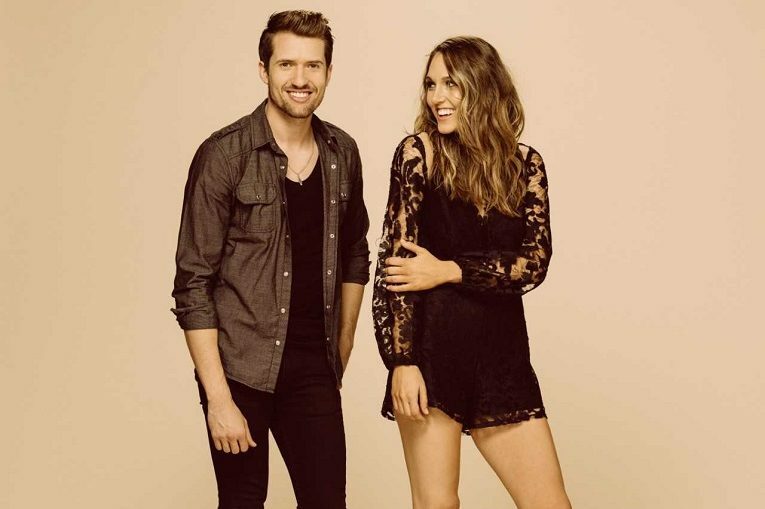 With drastically different musical influences, Fielder and Smith each bring their own unique flair to Smithfield, combining their talents to create a fresh sound that matches the likes of Lady Antebellum and Sugarland. Smith credits his sound primarily to the rock influences he had growing up. “I grew up on classic rock. In the 90’s I got really into the Goo Goo Dolls; watching Johnny Rzeznik explain how he wrote the song Iris is what really inspired me to start writing my own music. I got more into Country when I found out about Keith Urban and listened carefully to how he incorporated rock into country music. I wanted to do that, and when Jennifer and I started singing together we figured out that we fit the Nashville country scene really well,” Smith explained of his own musical background. Jennifer Fielder and Trey Smith have much to be proud of. With new representation under Deluge Music, which created the music label Deluge Records solely to support Smithfield’s artist career, they’re well on their way to the critical acclaim and musical popularity they have worked so tirelessly to achieve. Their most recent single, “Hey Whiskey” premiered on CMT and spent multiple weeks inside the top 5 of the CMT 12-Pack countdown. The song itself has spent six weeks in the top 5 of SiriusXM’s The Highway’s Top 30 Countdown and has racked up four million Spotify streams to date. The duo has just released a Spotify exclusive titled, “If It Ain’t You” to give fans a taste of what can be expected of their new EP, coming later this year. In addition to the new EP and their success with “Hey Whiskey”, Smithfield recently filmed an episode of Great American Country’s Great American Playlist, which will premiere on the network on August 20! For tune-in info, check Great American Country. Check out their website to keep up with Smithfield’s shows and music releases, and follow them on Instagram, Twitter, and Facebook!